Recognized as a Choice Outstanding Academic Title in 2011! Many people complain about the complex system used to nominate presidents. The system is hardly rational because it was never carefully planned. Because of the dissatisfaction over the idiosyncrasies of the current system, periodic calls arise to reform the presidential nomination process. But how are we to make sense of the myriad complexities in the system as well as in the calls for change? 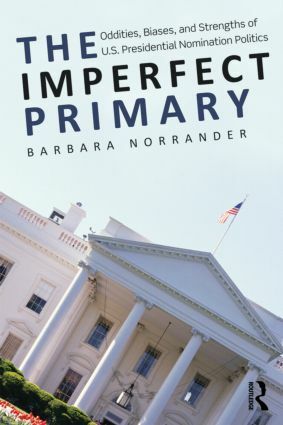 In The Imperfect Primary, political scientist Barbara Norrander explores how presidential candidates are nominated, discusses past and current proposals for reform, and examines the possibility for more practical, incremental changes to the electoral rules. Norrander reminds us to be careful what we wish for—reforming the presidential nomination process is as complex as the current system. Through the modeling of empirical research to demonstrate how questions of biases can be systematically addressed, students can better see the advantages, disadvantages, and potential for unintended consequences in a whole host of reform proposals. Is This a Fair Way to Select a Presidential Nominee?